Big thanks to Paul Salitsky for bring this process to our Aug 2018 Hack the Pack Night! The objective: add hydration to the Honey Badger. Paul thought the best approach would be to attach a hydration bladder to the laptop clip points. Great idea. 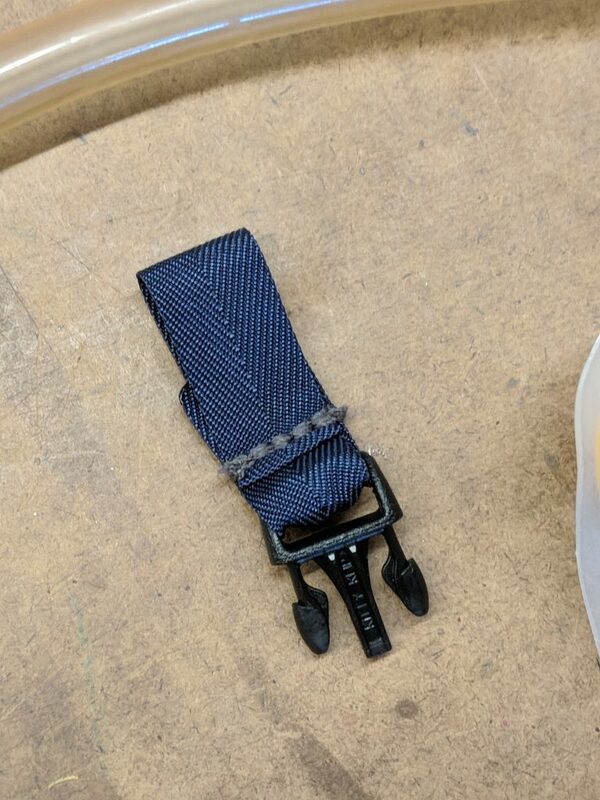 We reinforced the existing hanger points with a tough stiff fabric and grommets. 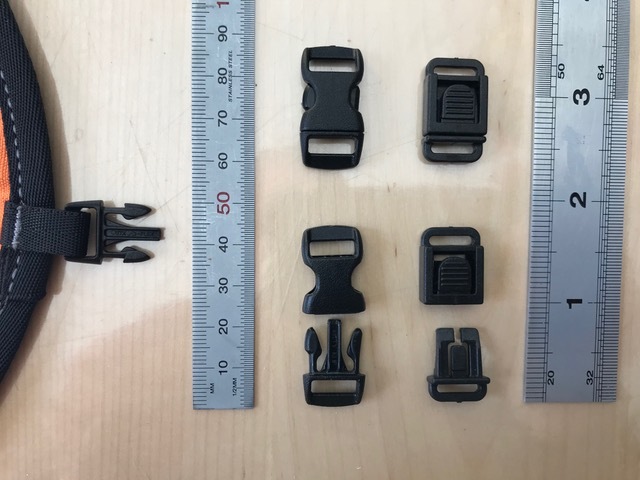 The next step was to add a connector with the male side of the clip that fits the laptop hangers. 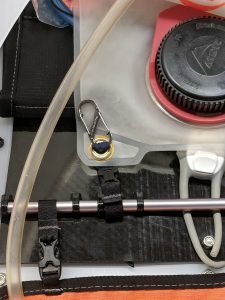 A bit of web should work to suspend the hydration bladder. 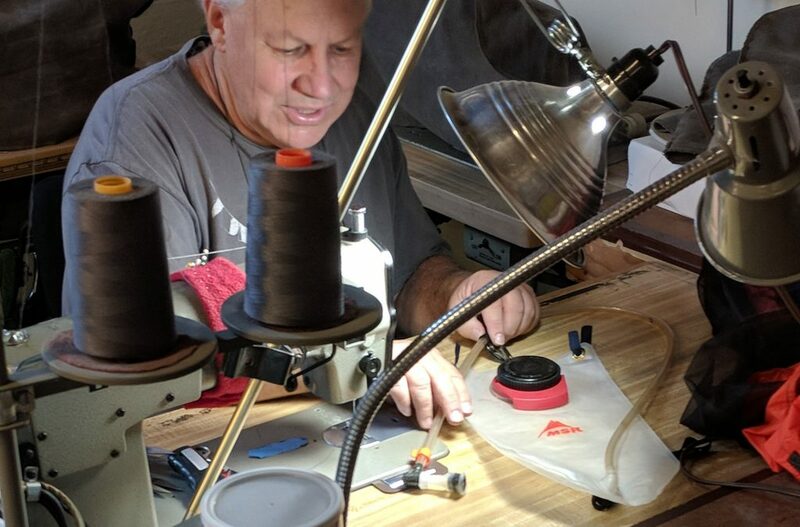 After a bit of testing to make sure the tolerances were correct, Martin sewed it up. What we’ve got is a hanger with a clip on one end and a loop on the other. 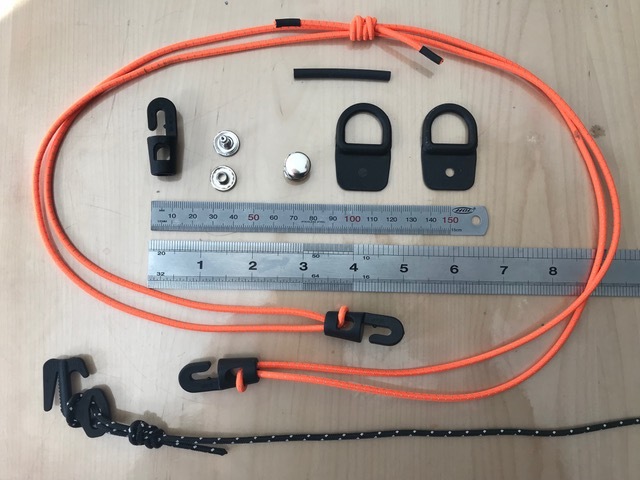 Paul used mini carabiners on the loop end. 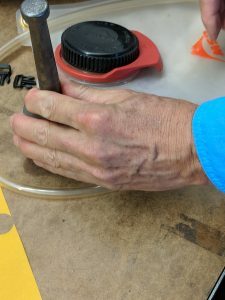 The final step is to add a hole for the drinking tube. 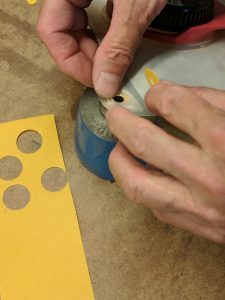 We made the hole with a Dremel tool. 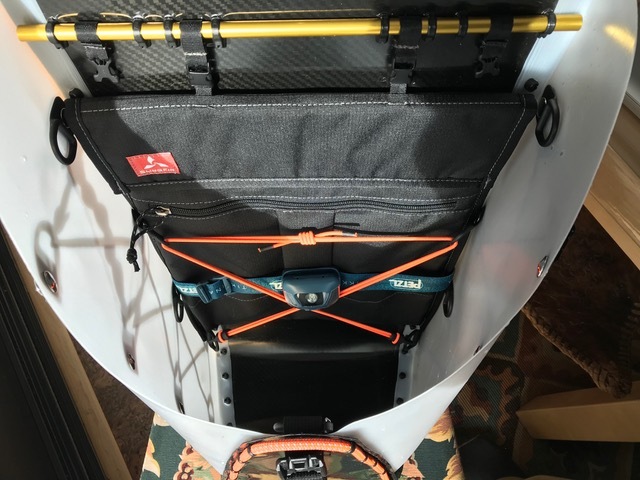 Al Tabor – loading the pack for a 2 night trip. 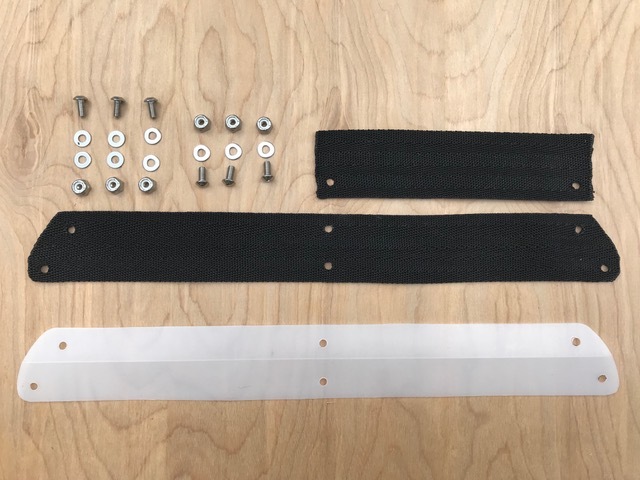 > Ellen Spitalnik: Adding a beefier (Dana Designs) waist belt. 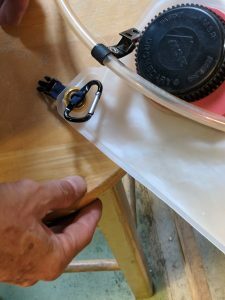 Replace the hinge with 1 1/2” webbing, and make an additional protective strip from the webbing to protect the tube from the edge of the lid. I used my soldering iron to melt the holes (philistine), and seal the ends of the webbing with heat too. 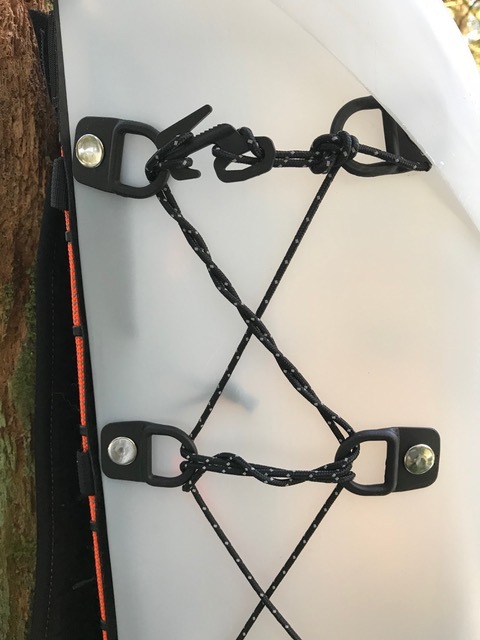 The screws will need to be longer to accommodate the extra thickness of the webbing, and additional washers are needed to sit under the nuts that sit on the webbing (inside the lid). 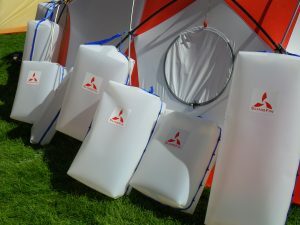 Sculpt cut-outs on the adjacent edges of the back panel and lid (seen here on the right), to accommodate the hydration tube. 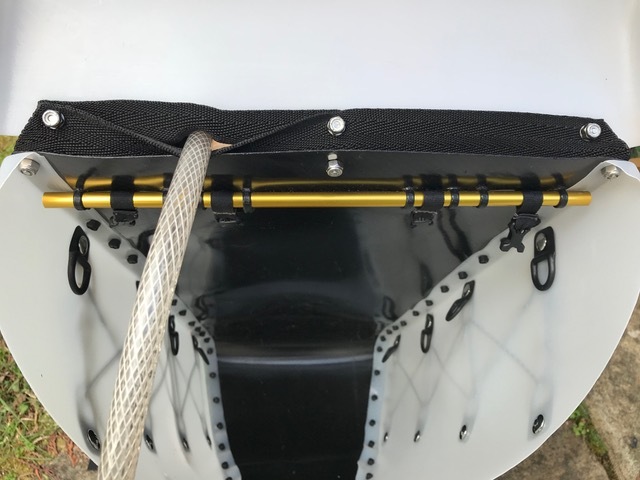 Showing the tube exiting the pack, replacement webbing hinge below, protective strip above. 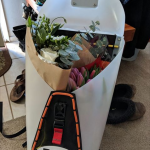 I’ve had heaps of compliments lavished upon me, or rater on the Honey Badger, both around San Francisco, and up here in Sammamish, WA. 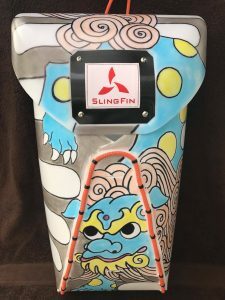 I’ve tried to get an ‘elevator pitch’ spiel for it, mentioning SlingFin and emphasizing durable, versatile, customizable, lightweight, etc. I’ve got a feeling there’ll be a lot of interest in this rucksack. First of all, there might be a small problem: I had to file down the barbs on computer pouch clips because I couldn’t release them by pinching them with my fingers, and before filing them down, had to use pliers to release them. This isn’t a problem with my top pocket clips. Maybe a different batch. Anyway, you might want to check the release of the clips you have there. Other than that, I’ve been having too much fun customizing my Honey Badger. Fantastic concept. I use the ‘illumination’ feature several times a week as I’m often walking to work before light. Super feature! For list of materials I used, see bottom. 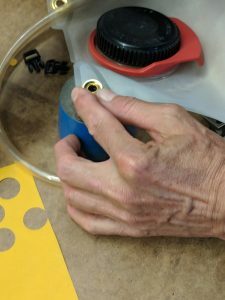 I fastened Sewable D-Rings (drilled ø 3/16″ holes in center of tab) to the screws on the lid for lashing stuff to the top. The lid could have the D-Rings on the inside too (I didn’t bother). I’ve put Sewable D-Ring tabs on the sides with 5” x 5” rivet spacing. At first I thought this detracted from the cleaner appearance of the original, but I’ve grown to like them (if you don’t look too closely at the rivets — it can be difficult to prevent some of the rivets tilting over). Whereas the rivets have a lower profile, the screws and locking nuts would be significantly easier to assemble. 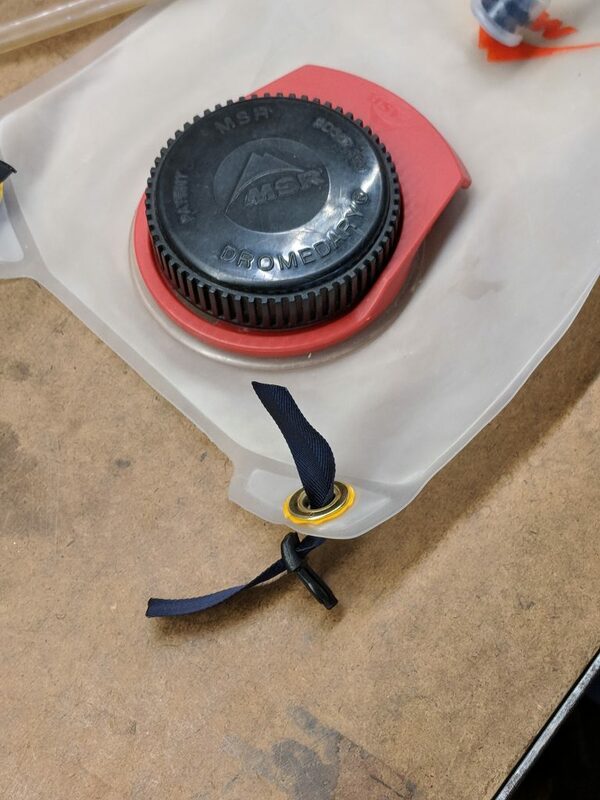 To prevent stuff rattling around when partially filled, I added Sewable D-Rings inside, using the same rivets as their counterparts on the outside. 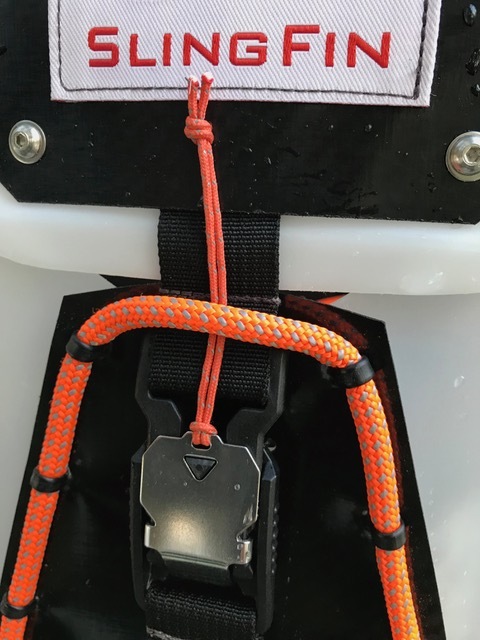 I’ve used a length of orange shock cord, doubled over, that threads through upper D-Rings, and hooks to lower ones. 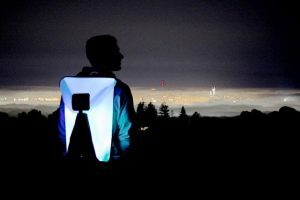 To illuminate the rucksack, I use a headlamp, which (obviously) can be useful as a headlamp in its own right. 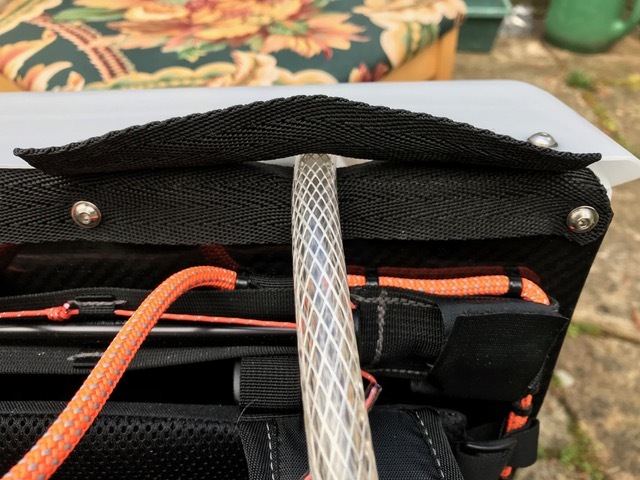 I keep it wrapped around the computer sleeve, and propped up by the crossing point of the orange shock cord that secures the computer sleeve from swinging and can secure books, files, etc. 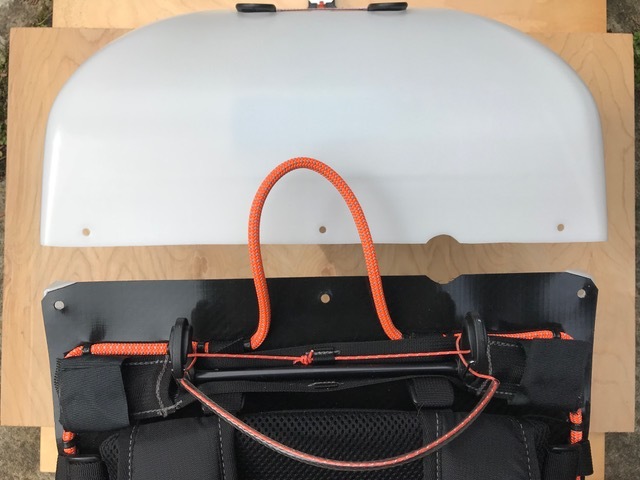 The only shock cord size available to me in reflective orange was ø 1/8″, so I doubled it up for the inside for firmness. I used a double fisherman’s knot to join the two ends, and tied the doubled-over shock cord into the double fisherman’s knot. The ends of the shock cord are sealed with 1/8” heat shrinking tube. I’d like to see other people’s customizations for inspiration, but I suppose the Feedback feature at the bottom of the web page would serve for this. You could mention the screw size used is #8-32 stainless steel button head cap screw x 1/4” long, with nylon insert lock nut, and washer. It’s all about solving design problems. That’s where this story begins…but then the solution went on a walkabout. 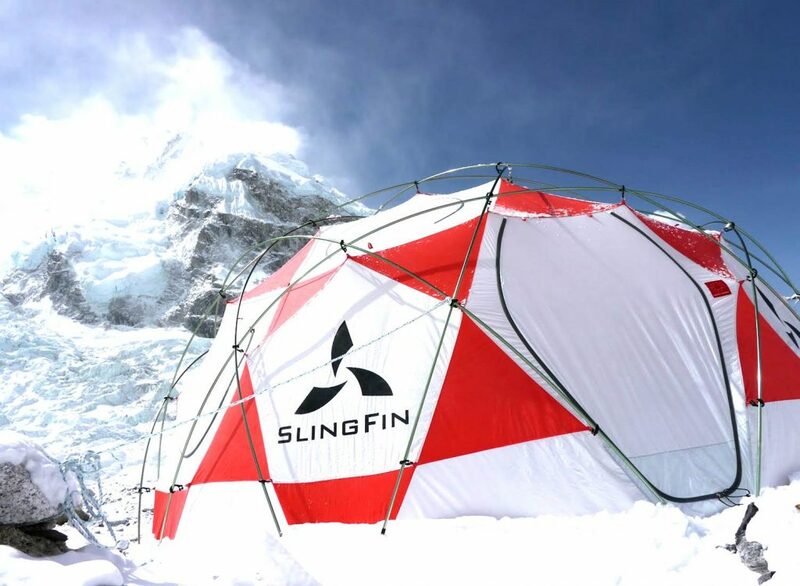 The Honey Badger story begins in the early days of SlingFin when lead designer Martin Zemitis needed an environmentally friendly way to ship his tents to Nepal. 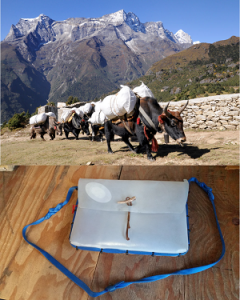 The problem: a tent used on Everest is generally shipped to Katmandu then sent on a trek of its own that often includes transport by yak and significant abrasion by rock and ice before arriving at Base Camp. Martin wanted something tough, light, and ‘sustainable’ to act as a shopping container. His solution was the Transfer Case, containers built from a scavenged durable material. His chosen construction technique used climbing rope or webbing and twist ties. The Transfer Case would be easy to construct in the office and repair in the field. After arriving the twist ties can be cut and the cases rolled up, tied with the webbing, and hauled out for reuse. The Cases had all the key features: tough, light, reusable. 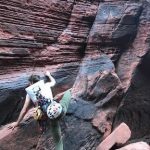 Outdoor gear innovation usually occurs at the intersection of a pain point and materials design. 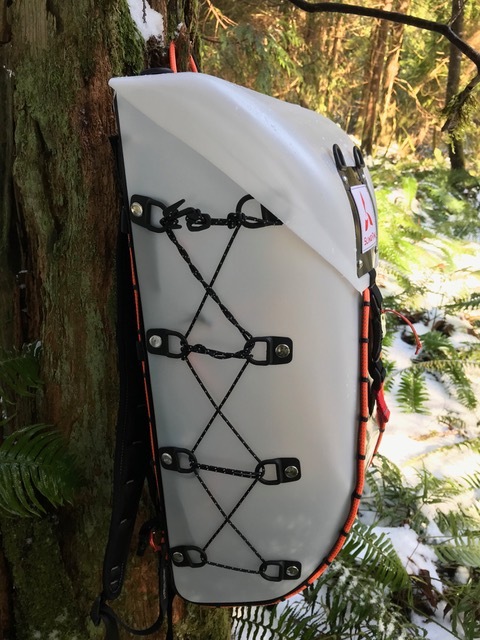 The first gear revolution in the 60’s used aluminum allows aircraft parts and arrow shafts, for example, combined with other ‘space age’ materials to revolutionize backpacks and tents. 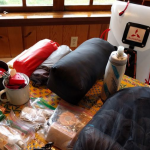 Recently Cuben fiber from sailing was used to redefine ultralight backpacking. 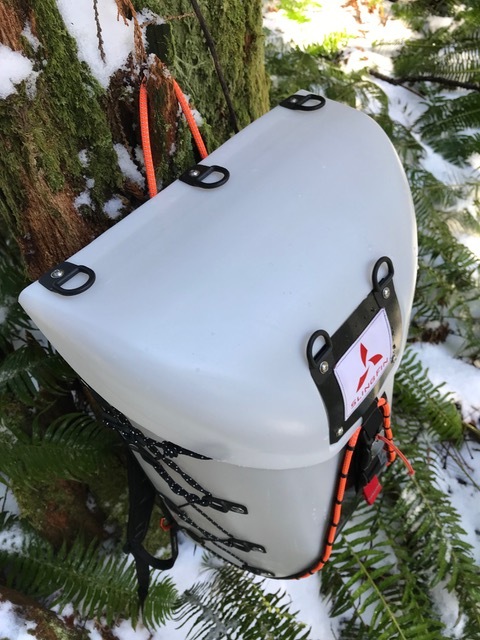 Here we had a solved pain point and used an interesting material…very light and extremely tough with a construction technique that was adaptable across a wide variety of containers. Martin’s sense was that there was potential here. Time to nose about and figure out: what does it want to be!? He started playing with the case material. 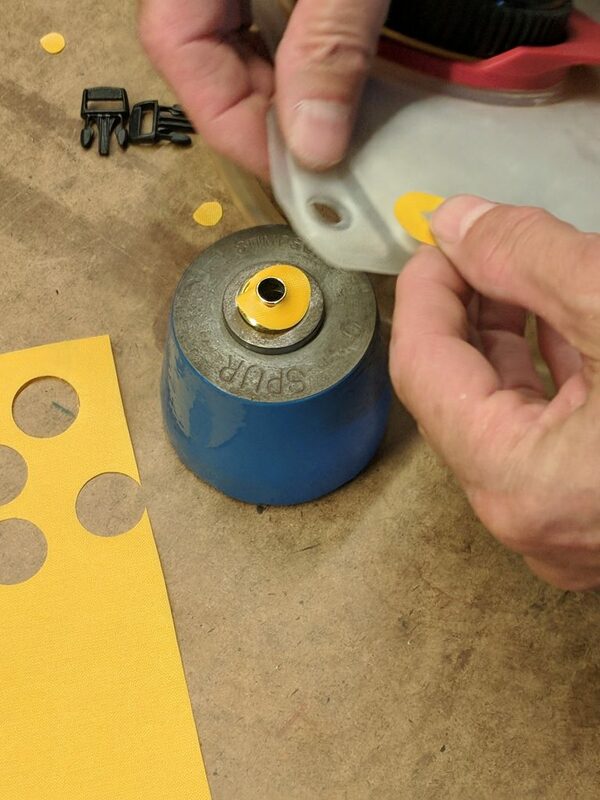 After a variety of different sorts of prototypes, various field tests, some sketching and a lot of musing we thought we had a bead on where this might go. 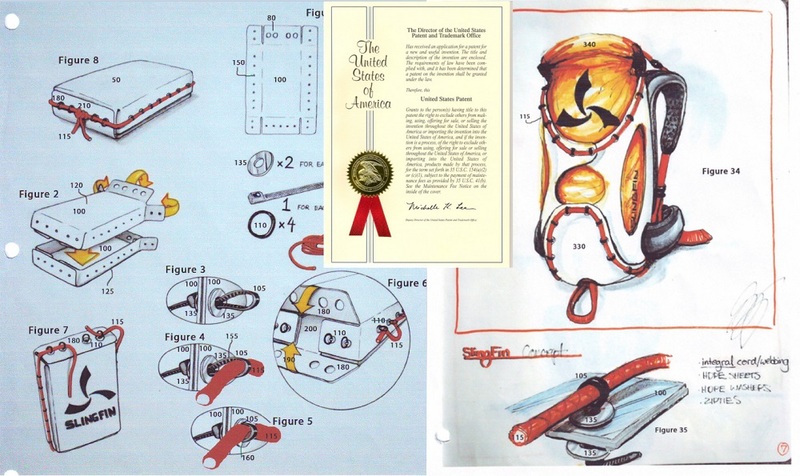 Martin filed a patent which was accepted. We started iterating on pack design. 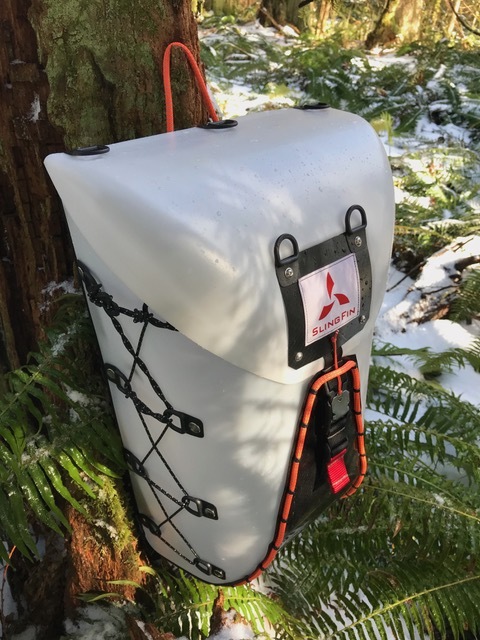 Any piece of back country gear is optimized around some set of trade-offs: weight vs durability, weight vs livability, waterproofness vs breathability…that sort of thing. 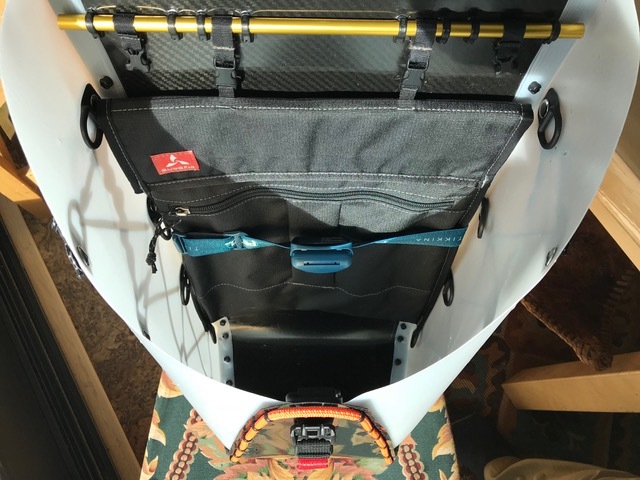 As pack design moved from external to internal frames we gained stability during a scramble, some aspects of comfort, weight…and lost some things. One thing remained consistent. Both approaches used a backbone of sorts. Structural integrity was provided by the frame be it it a back panel and aluminum stays (or, earlier, the full external frame) and then a sack and a harness were attached. The Honey Badger takes a radically different approach. 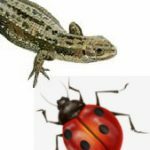 If your old pack is a lizard with a backbone, then Honey Badger is a bug. The structural integrity is provided by an exoskeleton. 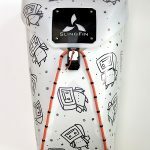 This allows SlingFin to work with the trade-offs in a whole new way. All of these could now be reconceptualized. 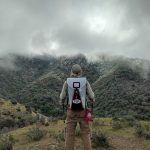 Support, carrying capacity, and durability were all handled by a single exoskeleton rather than a combination of cordura, aluminum, webbing, etc. That new construction was a much lighter replacement for anything close to as tough and durable. (This fit well with our company objective of creating the toughest gear for the weight in any category we entered!) 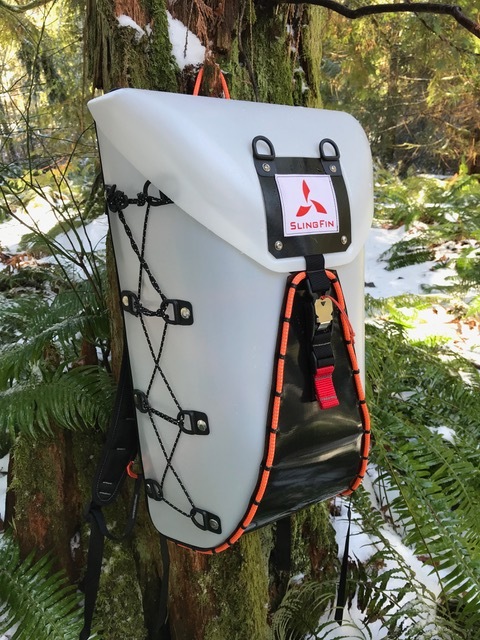 Furthermore, the pack could be smaller (and hence lighter) since capacity could be extended drilling holes and adding straps or literally bolting attachment points to the exoskeleton. 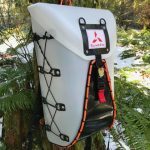 Waterproofness was handled by a simple extremely light weight dry bag. Design is never done. Ideas kept occurring to use. But It was time to try and bring a product to market. We chose the toughest shell material we could reasonably work with and produced a Propex Honey Badger Pack. We enlisted friends to help us shoot a video. We started prepping for a Kickstarter campaign. We had lots of fun trying to kill the pack in some dramatic fashion. 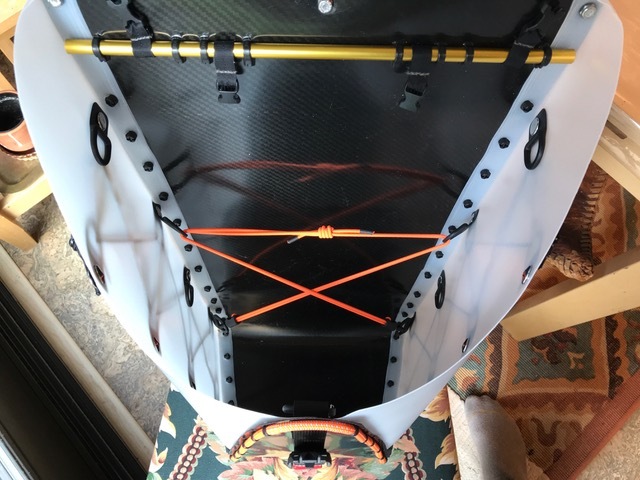 We even managed to pop two of the twist ties on the airplane drop and shred the padded shoulder straps by dragging the pack ‘wrong side down’ behind a truck. 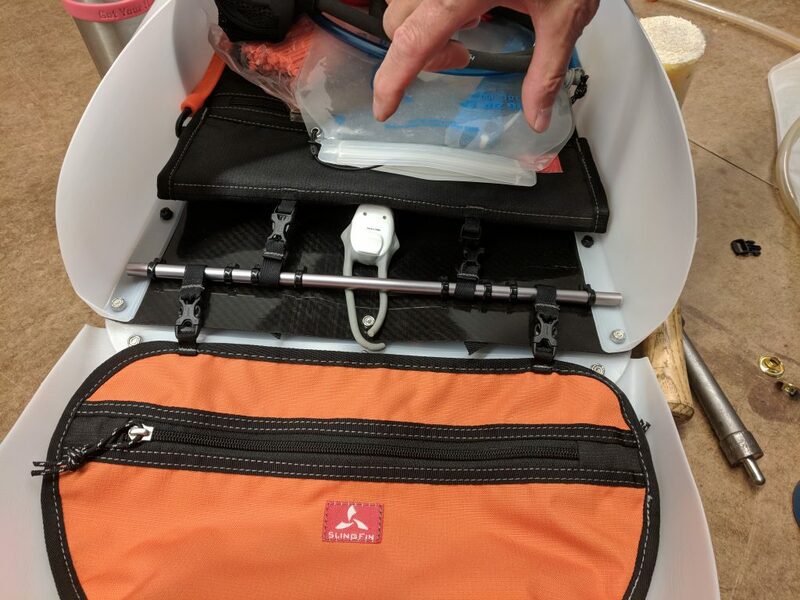 We, also, noted that the construction allows the harness to be easily removed so we could have avoided killing the straps if the pack was being drug up a rock wall, and that carrying a couple of twist ties would let you put the pack back in shape after you kick it out of the plane or off the ledge. We also discovered some hard truths about our marketing reach. 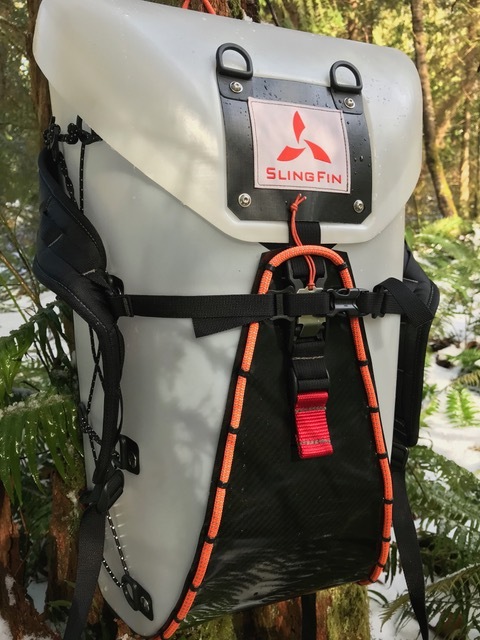 Apparently great word of mouth about SlingFin among mountain guides doesn’t translate into the ability to inform a broader public. Folks had trouble getting past the novel look and construction. And, oh, there might have been some delusional thinking in setting our goal. Yet, we continued to make discoveries that confirmed our belief in the project. 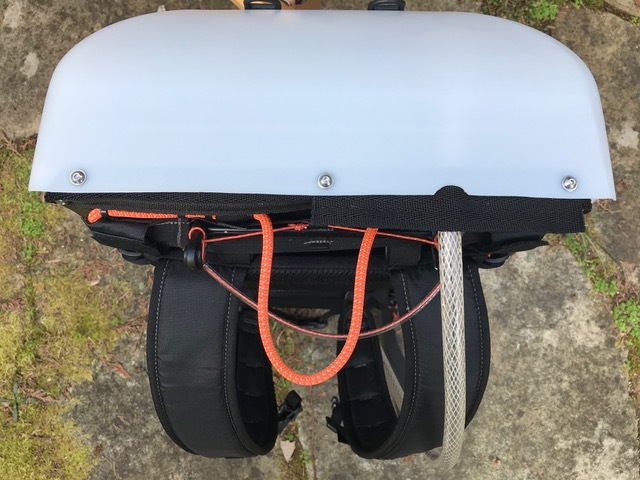 As an example, a few weeks before launch SlingFinian Devo figured out an easy way to convert the pack into a bike pannier. This has since been improved; you no longer have to remove the harness. The campaign ended without funding…but our resolve to make the Honey Badger available was only strengthened. 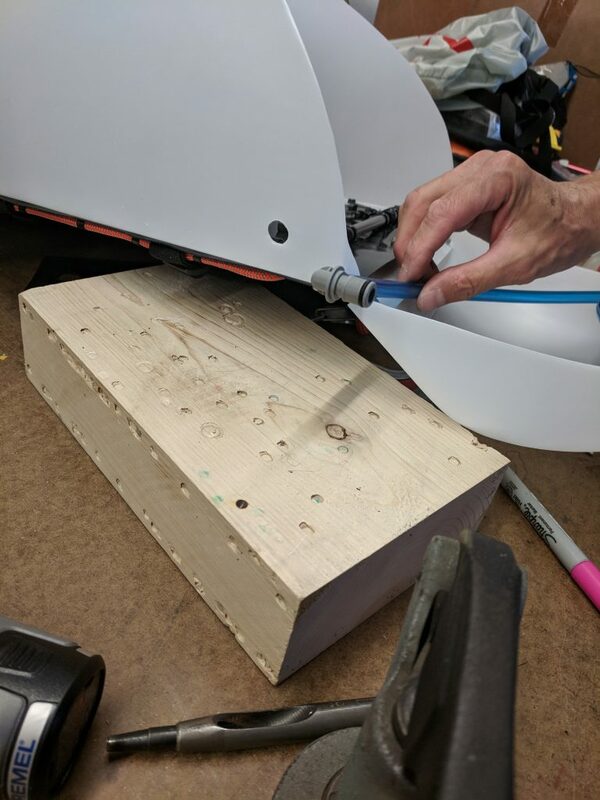 We continued to experiment with materials, fabrication, and features.We decided that vacuum forming was necessary to get a better working lid and side panels. This launched 6 months of research to get the optimum material formula and thickness for the vacuum formed parts. 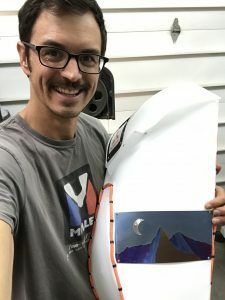 One thing we learned: vacuum forming is best done with specialized equipment. No need for you to try this at home, too. We’ve suffered on your behalf. We also found the tools to trim twist ties without leaving rough spiky ends. We figured out how to optimize the ‘glow in the dark’ visibility feature and continued to learn about how to use the pack with bikes. We discovered you could not only extend the pack functionally but skin it up stylistically. The accumulation of improvements, small and large, lead us to the point where we were ready for V2. Success! Check out the full presentation on Kickstarter. 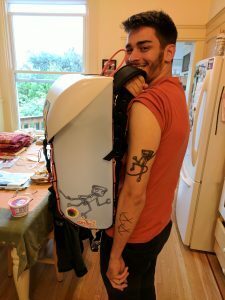 Thanks to Kickstarter and persistence, there are now dozens of packs in the hands of folks like you. Interesting things are happening with the pack that we never anticipated. Unlike most packs, the Honey Badger is a platform for your talents and experimentation. This is an adventure in product development, possible only because of your participation.